I’m very excited to bring you my Crispy Air Fried Chicken Egg Rolls! 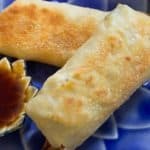 In one of my previous cookbooks (non smart point friendly) Amy’s Favorites, there is a recipe called Colonel Culling’s Yaki Mandu (Korean Egg Rolls). My father was stationed in Korea for about 18 months when I was young and when he came back he made these wonderful egg rolls. Later when I was writing, Amy’s Favorites, I realized I’m not sure how Korean they really were as they had Monterey Jack Cheese. Needless to say, they were delicious. Now that I’m on Weight Watchers, I decided to make over the egg rolls into something a bit more healthy. The original recipe called for pork sausage, so I replaced that with ground chicken. I added some cabbage, shredded carrots, ginger and used less of the Monterey Jack cheese. Instead of frying them, I decided to try baking as well as air frying them. I was uncertain how they would turn out as I love the fried ones, but these wonderful babies turned out great. I used olive oil spray from my Olive Oil Mister (don’t care for the cooking spray) and air fried/baked them for about 8 minutes on each side. These Crispy Air Fried Chicken Egg rolls are so delicious! You can bake them in the oven but I prefer to do them in the air fryer. They are also a great appetizer for a party as you can have ready to go, then pop them in the air fryer/oven when you want them. Before I had to fry them when the guests were already there as I wanted them hot, but not dried out. It’s so much easier to air fry/bake them! With this recipe I used the larger one (egg roll wrappers) instead of wonton wrappers. They are a bit bigger. 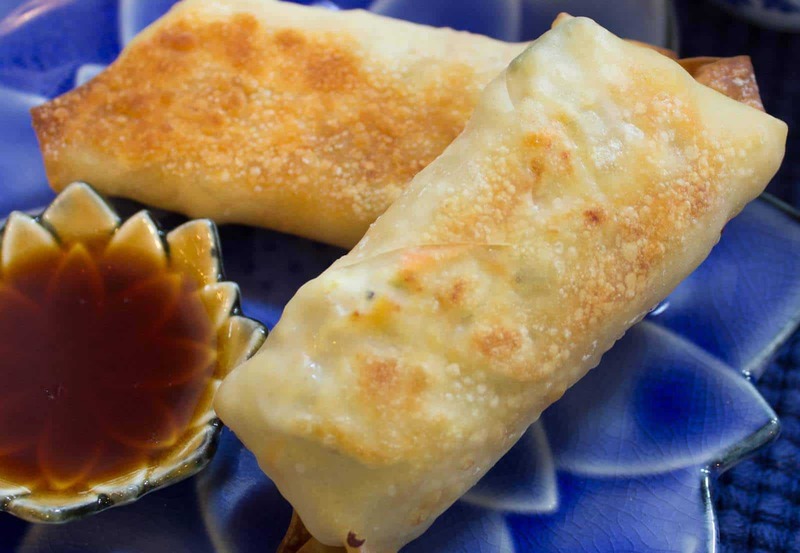 Only 2 smart points per egg roll and if you don’t use the cheese at all, it comes out to only 1 smart point. The ones without cheese are very good also. Warning! They can be addictive so only air fry/bake what you have points for! 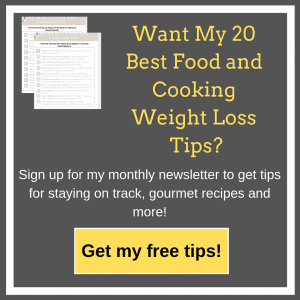 Preheat air fryer or oven to 400°. I have a Breville Smart Air Convection Oven that has an air fry setting. If using a different fryer, your time and temp may be a bit different. Just experiment and see what works best for you. One of my friends tested them out in her air fryer at 350° and did 8 minutes on one side, and 5 minutes on the other- that worked best for her. Prepare the air fryer basket by spraying with oil from your Olive Oil Sprayer. Or line 2 baking sheets with parchment sheets. Spray with olive oil. In a large non stick skillet, cook the ground chicken in 1 t. sesame oil. Drain off juice if there is any. Add 3 cloves (chopped) of garlic to the chicken and saute for just a few minutes. Turn off heat. In a large bowl, combine: cabbage, green onions, carrots, ginger, remaining garlic, peppers, jalapeno, salt and pepper. Mix well. Stir in chicken. On a flat surface (such as a cutting board) arrange one egg roll wrapper so that one of the points is pointing towards you (at your chest/stomach). Place about 1/4 c. of the filling toward the bottom point. Place 1 T. of cheese if desired on top of filling. Starting at the bottom point (the one by your chest/stomach) start to roll up the egg roll toward the top of the cutting board. As you roll, fold in each side. When almost finished rolling, dip your finger into a dish of water and run your finger along the top of the wrapper. Finish rolling up the egg roll. Place a dot of water on the outside of the wrapper so that the point will stay. Place the egg roll on prepared baking sheet or air fryer basket. Spray lightly with olive oil spray. Turn egg roll and spray the other side. Roll and spray for the rest of the egg rolls. Bake in preheated air fryer or oven 350° for about 6-8 minutes. Then flip over with a spatula, spray with oil and bake another 6-8 minutes until crispy looking. Serve hot with soy sauce. A few tips: You can make these up a day ahead. Be sure and keep the wrappers covered while you work with a damp paper towel. After placing on baking sheet, spray with oil immediately. Keep covered until all are done. If you aren’t baking them for a while, cover with plastic wrap and store in refrigerator (up to 2 days). I don’t recommend freezing them as the texture isn’t as good. No Replies to "Crispy Air Fried/Baked Egg Rolls"